On January 23-27, 2017, Fr. Provincial, John Michael Rafferty, meets with the Vocation Director of Saint Augustine Province, Fr. Jorge Mateos, and his team, Fr. Ramón Gaitán, Fr. Eric Crelencia, Fr. Jorge Valdivia, Fr. Francisco Sandoval, Fr. José Luis Martínez, Fr. Felizardo Daganta, and Deacon Ulises Feliciano, at Saint Augustine Priory, Oxnard, California. Fr. 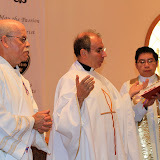 Cristino Gutiérrez Rubio and Fr. Honorio Calvo (of Saint Nicholas Province) are also in attendance. This meeting is the first vocational meeting of St. Augustine Province with the cooperation of Saint Nicholas Province, which reflects the ongoing mutual collaboration between the two provinces in their efforts toward unification in 2018. Let us pray that Our Mother of Consolation will watch over them and guide and encourage them in this very important vocational ministry.